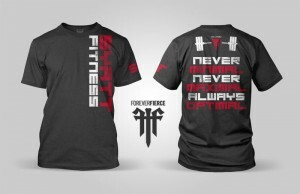 I’m ordering new Syatt Fitness t-shirts and this is the latest design. I’ll be ordering a number of different styles (including women’s fit and hopefully some tank top variations) so don’t worry – there’ll be an SF tee for everyone. I don’t have them in stock yet but if you definitely want one shoot me an e-mail to jordanATsyattfitnessDOTcom letting me know your size and preferred style (t-shirt, tank, women’s fit, etc). This way I can make sure I reserve you a tee in the first batch rather than having to wait for a second order. In the meantime I’ve got a bunch of great info for you in this installment of The Week in Review so get comfortable – might wanna grab an iced coffee (I’m sipping on mine right now) – and enjoy! Monday’s Strength Lesson: Your goal determines your focus. Your focus determines your path. Your path determines your success. First and foremost, establish a goal. It’s rarely a good idea to jump head first into something without having at least *some* idea of what you’d like to accomplish. Whether it’s fitness-related or something different altogether, establishing a goal will not only allow you to create a clear-cut plan to help you achieve it, but it will also give you direction when the going gets tough. Your pre-defined goal will help keep you focused on the prize when you begin to forget why started this whole process in the first place. Your goal determines your focus. Your focus determines your path. Your path determines your success. One of my personal favorite drills with countless variations, the Batwing row is an extraordinarily simple, albeit effective, movement that can easily be incorporated into your training programs. I tend to use the Batwing row as a light(er) accessory exercise near the end of my upper body training sessions for anywhere between 8 – 20 repetitions. For simplicity’s sake, today’s full body training session can be done using strictly a barbell and your own body weight. Basic, simple, and *extremely* effective. Thursday’s Strength Lesson: Want to be able to do chin-ups? Get off the damn lat pull down machine! A common recommendation for those who can’t do chin-ups is to use the lat pull down machine until they’re strong enough to do a real chin-up. Personally, I think that’s stupid. Sure, the lat pull down can be used initially to help teach proper muscle recruitment patterns and build a base level of strength, but once that base is built the lat pull down is *NOT* going to do much, if anything, for your chin-ups. Get on the effin bar and start doing chin-up variations! Start with relatively easy variations that allow you to go through a full range of motion and progress your way up until you’re doing real chin-ups. 1) Negative Chin-Ups: Jump up to the top of the bar and slowly lower yourself for 3-5 seconds until you reach the bottom position. Step on a box, jump back up to the top, and repeat for 3-5 sets of 3-5 reps.
2) Band Assisted Chin-Ups: Start with a relatively strong band and perform 3-5 sets of 4-8 reps. Once you can perform 8 reps with a given band, switch out to a lighter band that makes it more difficult and repeat the same process over and over until you’re no longer using a band.